There is no substitute for the featured benefits of the presence of natural rock in a well-designed landscape. Whether a project calls for the arrangement of large placement rock or the inclusion of a secluded dry riverbed, Landscape Design & Landscape Construction, Inc. specializes in utilizing this unique medium to bring undeniable benefits to any project. By evaluating the effects of texture, color, and form, the careful positioning of these elements successfully harmonizes the landscape with the natural environment. The tasteful integration of rock groupings into the landscape can form a creative foundation of unity throughout the site. Natural placement rock may be functional in several forms, whether it serves as a subtle retention of a slope or bringing an original material into the landscape. The unique and graceful forms of natural rock introduce attractive color and texture to the composition of a rewarding landscape. 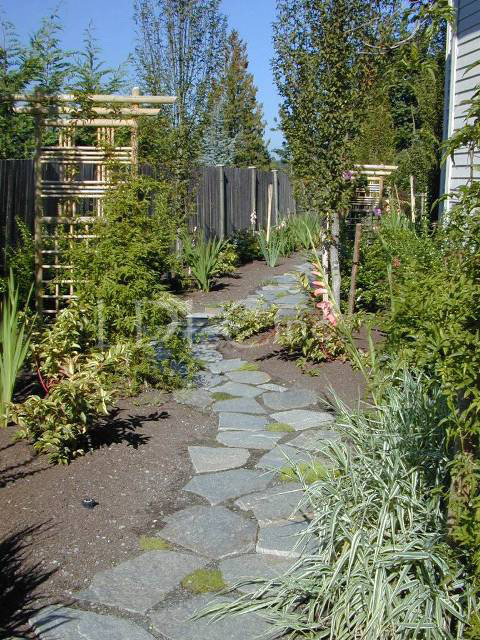 By placing rocks using asymmetrical balance and combining vertical and horizontal elements, these features add a natural quality that may be enjoyed throughout the seasons. Providing virtually the same aesthetic functions and emotional impact as water features, dry riverbeds incorporate the natural elements of water without the typical maintenance. The soft flowing surface of river rock, smoothed by decades or running water, may be used as a unifying feature in a landscape while providing for the desired function of drainage and the suggested presence of water. Providing access between elevations and spaces within a landscape, the use of stone stair systems incorporates the natural aspect of rock with the specific function of pedestrian circulation. When used in conjunction with rock groupings, the grandeur of rock stair systems offers a unique opportunity to bring character and charm into the experience.